We are located in Dade City, FL just a few miles east of I75 (North of Tampa and South of Ocala). We breed miniature dairy goats, primarily Nigerian Dwarf, but we are also breeding some Mini-Manchas. All of our Nigerian Dwarfs and our LaMancha does are ADGA registered and our mini goats are MDGA and TMGR registered. We strive to breed quality dairy goats that perform well for dairy and show and of course as pets. Our registered does are priced at $400 and up, registered bucks $300 and up and wethers are $100 & $125. We do offer FFA and 4H discounts. We are proud members of ADGA, AGS, NDGA, MDGA, TMGR, NDGCF and FDGA. 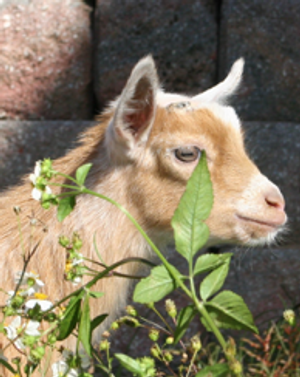 We take pride in our goats and strive to breed top quality miniature dairy goats. 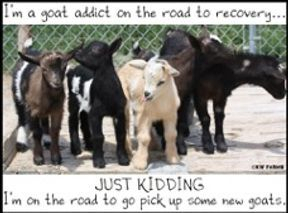 We are here to help our customers with their new goats.